its sequel to a somewhat lesser extent. I love this game its your basic racing game.. but what makes it funny is if you goto quailfiy and if you finsh you can hit the guy with the checkerd flag! and instesd of him falling. e gose sailing into the air far far away! its a hoot! 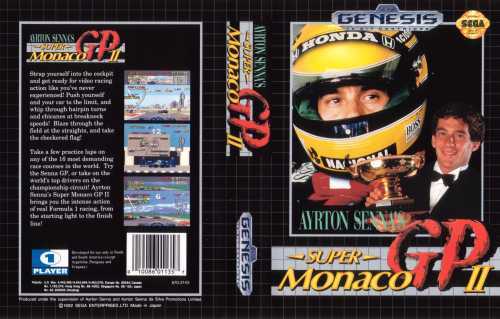 Super Monaco GP was an awesome racing game for its time. It's challenging and takes lots of practice to master. There is a bug in the game: sometimes you'd hear a car approaching from behind, then pass you by, but there was no car! It's known as the "Ghost Car". These Racing games are great! They have ok gameplay and good grafical effects. The music is also quite good! The levels might look a little samey but this type off racing game always looks like that. Its ok, but there are better. 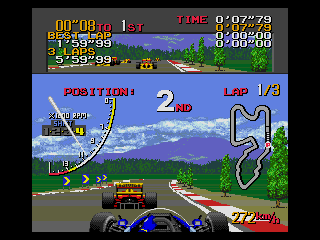 Both good early racing games. Good fun, it feels a little like the arcade pole position but without you speeding up on corners. For some reason, the first game appealed to me more then the second. Perhaps I'm just getting old. 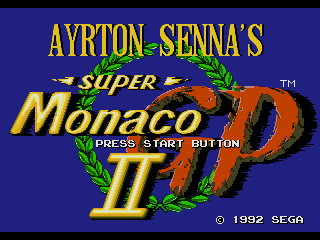 The Ayrton Senna's Super Monaco GP 2 version was miles better than the first. Really good fun and the whole transferring to better teams stuff really adds interest. Ol�. Algu�m poderia me falar (em portugu�s) se este site tem ROMs? E indique-me o local � clicar. Eu tive um mega-drive na inf�ncia, mas desde muito tempo n�o tenho not�cias mais dele, certeza de que a minha doou. Agora eu tenho que recuperar tudo por aqui n�! I remember this was the second game I had for Genesis. It was so much fun. I remember almost everytime I would play, I would take a turn too fast, causing me to destroy my car on one certain sign or tire stack. Oh! And hitting the guy with the checker flag and causing him to fly into the background was always fun too. A great game! In SPMGP 1, does anyone notice on your profile, it looks like your left eye is shifting left and right constantly while your right eye is standing still? Is your character supposed to be on drugs or something? This game is class, its great that you can pick it up and only do a couple of races then save it for coming back to. This is a great racing sim. You will have to win challenges against the other pilots of other teams and you will get their seat. Making this you will be promoted from one team to another and when you get a good team like Firenze you will have the Championship Trophy. 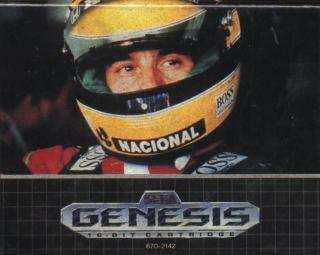 This and Ayrton Senna�s Super Monago Grand Prix II are my favourite racing games. Monaco GP I has a good gameplay, and good sound. One of the missing points is that you only have one camera instead of 2 or 3.